AGP leaders led by party chief Atul Bora meet Meghalaya Chief Minister, Conrad Sangma on Friday. Image: Northeast Now. 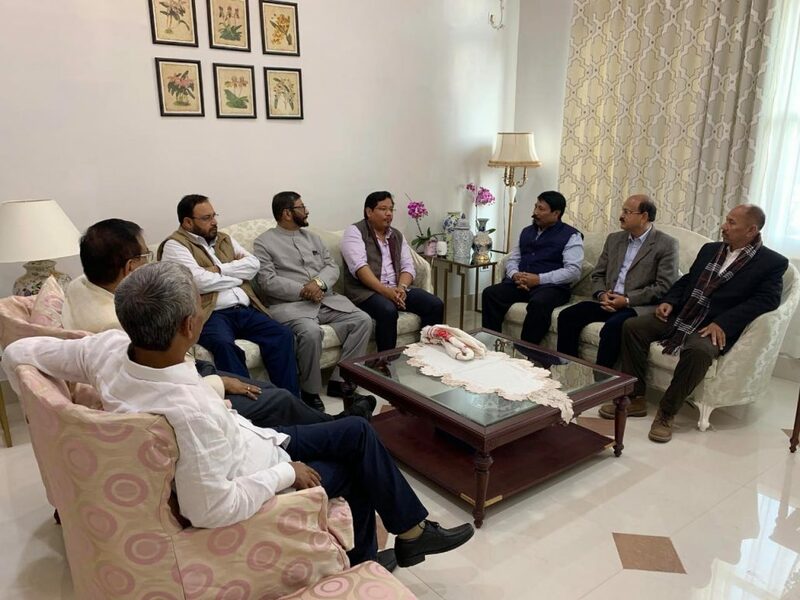 An Assam Gana Parishad (AGP) delegation-led by party president Atul Bora on Friday met Meghalaya Chief Minister, Conrad Sangma at his residence in Tura and unanimously decided to chalk out a joint strategy to oppose the contentious Citizenship Bill. The meeting discussed at length the threat the Bill can pose to the people of entire northeastern states and decided to oppose the Bill jointly. While the AGP recently snapped its ties with the BJP-led government in Assam, the BJP is a partner of the National Peoples’ Party (NPP) government in Meghalaya. Meghalaya Chief Minister Conrad Sangma appreciated the strong stand taken by the AGP over the Citizenship (Amendment) Bill 2016 and said that all the seven states of the northeast India should jointly fight against the contentious Bill. “The Bill will not only jeopardise the identity of the indigenous people of Assam and other states in the Northeast India but will also bypass the historic Assam Accord,” said Atul Bora. He further added that the ongoing process of updating of the National Register of Citizens (NRC) would also be affected if the Bill was implemented. The NPP leader, Conrad Sangma in his recent meeting with Union Home Minister, Rajnath Singh registered storn opposition to the Citizenship Bill. The Meghalaya Cabinet headed by Conrad Sangma had already taken a resolution to oppose the Citizenship (Amendment) Bill.